CICAP (Comitato Italiano per il Controllo delle Affermazioni sulle Pseudoscienze; in English Italian Committee for the Investigation of Claims of the Pseudosciences) is an Italian, non-profit, skeptic educational organization, founded in 1989. CICAP's main goals are the promotion of the scientific analysis of alleged paranormal and pseudoscientific phenomena. It is a member of the European Council of Skeptical Organisations. 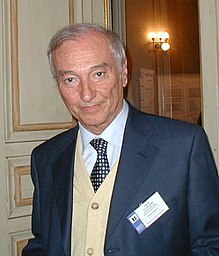 CICAP was started by the Italian science journalist Piero Angela together with a group of scientists including Luigi Garlaschelli. The first attempt at creating an organization that investigates alleged paranormal phenomena in Italy dates back to 1978, only two years after the founding of CSICOP (today CFI), when following Piero Angela’s television show Indagine sulla parapsicologia (Inquiry on Parapsychology), 22 scientists and researchers of various disciplines released a common declaration calling for the establishment of a committee for the examination of alleged paranormal phenomena. The initiative didn't come into being until 1987-1988, when Piero Angela organized numerous meetings amongst the Italian subscribers of Skeptical Inquirer magazine that terminated with a meeting in Turin on October 9, 1988. During the meeting, the association’s goals and objectives were defined along with the name for the committee: Comitato italiano per il controllo delle affermazioni sul paranormale (Italian Committee for the Investigation of Claims of the Paranormal), chosen because the acronym “CICAP” resembled “check-up” in English. The Committee was formalized on June 12, 1989. Lorenzo Montali was appointed executive director and Massimo Polidoro the director of the association’s magazine. Two Nobel Prize laureates are or have been members: Carlo Rubbia and Rita Levi Montalcini. Other notable members included the philosopher, semiotician and novelist Umberto Eco. As of 2009[update], the executive director is Italian skeptic investigator and writer Massimo Polidoro. In the beginning, CICAP was primarily concerned with parapsychology (telepathy, psychokinesis, etc.). With time, CICAP began branching out into other areas of pseudoscience (such as alternative medicine), both historical (such as those involving dragons or the sword in the rock) and above all, contemporary legends (urban legends). The rise in popularity of other pseudoscientific phenomena prompted the organization to change its name. In September 2013, CICAP announced a change in its name altering the P of the acronym from paranormale (paranormal) to pseudoscienze (pseudosciences). The new name includes not only supernatural phenomena, but also pseudoscientific ideas and claims regarding treatments whose efficacy is not scientifically proven, conspiracy theories, urban legends and historical falsifications. A short list of CICAP investigations during its history includes verifying astrological predictions, powers of magicians, dowsers, healers and fakirs, UFOs, the blood of St.Januarius and contacts with the afterlife. CICAP also deals with verifying astrological predictions. In fact, every December, it collects a sample of astrological predictions made by astrologers and clairvoyants during the year and publishes a year-end report on the outcomes of the predictions. Since 2009, CICAP organizes an annual “Anti-Superstition” day in various cities during a Friday the 17th. The organization has always worked closely with Italian media to help insure accurate coverage of paranormal topics. In October 2004, CICAP and the CSI co-sponsored a World Skeptics Congress in Italy. CICAP's Logo is based on the grid illusion. Designed in 1992 by Franco Ramaccini, was amended in 2009 with the inclusion of the words, "Comitato Italiano per il Controllo delle Affermazioni sul Paranormale". Paranormal Phenomena which would violate the fundamental laws of modern science: investigations of parapsychology such as telepathy, precognition, clairvoyance, telekinesis. Other subjects that fall under this category are generally described as "scientifically inexplicable": fire-walking, Electronic voice phenomena (EVP), religious paranormal events, and so on. Pseudoscience: those disciplines that claim to be scientifically valid but that systematically elude experimental verification when the scientific method is applied: astrology, alternative medicine, creationism, Earth Radiation, numerology, etc. Mysteries and legends: stories that are not strictly paranormal but are unusual such as urban legends, UFOs and alleged alien events such as crop circles, traditional legends such as those involving dragons or the sword in the stone. CICAP applies rational skepticism in its activities. This posits that every empirical statement can only be accepted after experimental verification. CICAP applies the scientific method to its investigations. CICAP often employs the collaboration of magicians in its investigations to ascertain the possible use of tricks. For example, Silvan is a CICAP sympathizer and has collaborated with CICAP in some of its initiatives. CICAP does not cover metaphysics, in particular religion and faith, because these phenomena cannot be studied scientifically. CICAP investigates religious claims regarding material manifestations such as relics or the St. Janarius blood miracle in Naples because these phenomena are subject to scientific examination. CICAP is interested in informing the public. Its members have different religious and political beliefs, but they all agree that alleged pseudoscientific phenomena must be investigated and the results publicized. The association is self-financed  and its supporting members are its only sustaining force as shown in the fundraising campaign implemented in early 2000: “Progetto CICAP 2000” (Project CICAP 2000) whose aim was to give the committee a permanent headquarters. The goal was to raise the 300 million lire for the acquisition of the necessary infrastructure. The goal was achieved and the office space was purchased in Padua. Curious, given that his fortune was based on the artistic and literary paranormal, was the adhesion of Tiziano Sclavi, who contributed five million lire. Sclavi is in fact a supporter of CICAP and declared that the occult and paranormal are great in fiction but that reality is a whole other thing. The national headquarters is located in Padua while the bulk of the outreach activities and the national press archive are located in Turin. Some regions have local groups or chapters with their own CICAP branches. Currently, there are local groups in Abruzzo-Molise, Emilia-Romagna, Friuli-Venezia Giulia, Lazio, Liguria, Lombardy, Piedmont, Apulia, Sardinia, Sicily, Tuscany, Trentino-Alto Adige, Veneto. Furthermore, there is a local group in Canton Ticino, Switzerland. Every two years, CICAP organizes a national conference, CICAP fest, where internal and external speakers meet to discuss a paranormal or pseudoscientific theme. It features panel discussions, talks and exhibits and relies heavily on volunteer efforts. The conference is held altogether in italian, but usually accommodates english speaking speakers with simultaneous interpretation, to enable international participation in panels and talks. In 2018 the conference focused on magic. Speakers included James Randi, Susan Gerbic, Carol Faggi, Max Vellucci, Gianfranco Preverino, Pino Rolle, Francesco Busani, Marco Aimone and Alex Rusconi as well as popular TV personalities. Executive director of the conference is Massimo Polidoro. The conference is open to the general public, but requires a participation fee that is used to finance the group’s activities. In September 2005, National Geographic Channel's program Is It Real? (episode 10) asked for a demonstration of "Knockout" Chi (a no-touch knockout technique), during which instructor Leon Jay was unable to knock-out Luigi Garlaschelli, an investigator from CICAP. In September 2016, CICAP tested a mother and daughter pair that claimed they could psychically transmit zener cards to each other. Massimo Polidoro and Luigi Garlaschelli tested the women Amalia Maruca and mother Carmela Paola at the offices of Nuova Menle. The women had been reported to have a 90 to 100 percent accuracy rate by newspaper La Nuova Provincia de Biella. Polidoro and Garlaschelli used a small blind between the women to remove their ability to see the cards, but they had a clear view of each others faces. During the first test the result was 24 correct out of a run of 25 cards. A higher blind was next used so they could not see each other and the results were 7 correct out of 25 cards. The third round used a tablet computer which eliminated the sound of pen drawing on paper, a technique called "sound reading". The results were 5 correct out of 25 cards. For the final tests, zener cards were eliminated and cards with popular optical illusions were used. The women stopped the test after 5 cards saying they could not transmit. CICAP switched to normal playing cards, the results were 2 out of 25 cards. CICAP concluded that the effect disappears when the women could not see each other and no telepathy existed when non-zener cards were used. CICAP continues its dissemination activities through conferences and public lectures, radio and television appearances, through the publication of Query a quarterly magazine (formerly Scienza & Paranormale, Science & Paranormal), books and articles regarding these topics, through the conservation of a library and an archive of articles. Additional material, both on CICAP own research as well as foreigner skeptical and scientific papers translated into Italia, is published on QueryOnline, the online version of the printed magazine. ^ "STATUTO del Comitato Italiano per il Controllo delle Affermazioni sul Paranormale" (PDF). www.cicap.org (in Italian). Retrieved 17 September 2014. ^ "Skeptics Organisations ECSO Members". Retrieved 17 September 2014. ^ a b c d e "FAQ - Tutto quello che vorreste sapere sul CICAP" (in Italian). Retrieved 17 September 2014. ^ a b Polidoro, Massimo. "CICAP: 1989-1999: Bilancio su 10 anni di attività e prospettive future". CICAP (in Italian). Retrieved 17 September 2014. ^ a b Mangiardi, Umberto. "Il Cicap di Torino : scopriamo che cos'è" (in Italian). Retrieved 18 September 2014. ^ "TheESP - Ep.#018 - Massimo Polidoro by European Skeptics Podcast". soundcloud.com (Podcast). 13 April 2016. Event occurs at 24:17. Retrieved 25 January 2019. ^ a b c McMahon, Barbara (October 6, 2005). "No blood, sweat or tears". The Guardian. Retrieved July 28, 2009. ^ "About CICAP". cicap.org. CICAP. 2007. Retrieved July 29, 2009. ^ "Il CICAP cambia nome: non più solo 'paranormale' ma 'pseudoscienze'". cicap.org (in Italian). CICAP. September 9, 2013. ^ a b c "CICAP's activities". Retrieved 25 September 2014. ^ "Venerdì 17 luglio 2009: Il CICAP lancia la "Prima Giornata Anti-Superstizione"" (in Italian). Retrieved 25 September 2014. ^ "Venerdì 17, la gimcana contro la superstizione". Milano Repubblica (in Italian). Retrieved 25 September 2014. ^ Nisbet, Matt (August 31, 2000). "Introducing Italy's Version of Harry Houdini". Generation SXeptic. Ithaca, NY: Committee for Skeptical Inquiry. Archived from the original on 2009-08-02. Retrieved July 29, 2009. ^ "World Skeptics Congress 2004". cicap.org. CICAP. Retrieved 2009-07-29. ^ Minotti, Andrea. "Esiste davvero il paranormale? Intervista a Massimo Polidoro, esperto del CICAP". Retrieved 2 November 2014. ^ a b "Interview with Massimo Polidoro (47:20)". SGU Productions. Retrieved 10 July 2014. ^ "Umberto Eco e Tiziano Sclavi parlano del CICAP". Retrieved 2 November 2014. ^ Gerbic, Susan. "Skeptical Adventures in Europe, Part 4". Csicop.org. CFI. Retrieved 20 January 2019. ^ Garlaschelli, L.; Ramaccini, F.; Della Sala, S. (1994). "The blood of St. Januarius". Chemistry in Britain. 30 (2): 123. Retrieved July 28, 2009. ^ Williams, William F. (2013) . "Januarius, St., Miracle Of". Encyclopedia of Pseudoscience: From Alien Abductions to Zone Therapy. Routledge. p. 168. ISBN 9781135955229. ^ Polidoro, Massimo (December 12, 2000). "Secrets of a Russian psychic". cicap.org. CICAP. Retrieved July 28, 2009. ^ "SPECIAL CROP CIRCLES". Retrieved 2 November 2014. ^ Polidoro, M. (May–June 2008). "Just like Jedi Knights (if only)". Skeptical Inquirer. 32 (3). Committee for Skeptical Inquiry. p. 21. ^ Polidoro, Massimo (2018). "A Telepathy Investigation". Skeptical Inquirer. Committee for Skeptical Inquiry. 42 (5): 21–23.